Neutron Star Merger Seen in Gravity and Matter: This visualization shows the coalescence of two orbiting neutron stars. The right panel contains a visualization of the matter of the neutron stars. The left panel shows how space-time is distorted near the collisions. Rochester Institute of Technology researchers played a significant role in an international announcement today that has changed the future of astrophysics. The breakthrough discovery of colliding neutron stars marks the first time both gravitational waves and light have been detected from the same cosmic collision. “Multimessenger astronomy,” a new way of understanding the universe, will give us insight into how supernova explosions work, how gold and other heavy elements are created, how the nuclei in our body works and even how fast the universe is expanding. The breakthrough was made by the U.S.-based Laser Interferometer Gravitational-Wave Observatory (LIGO), the Europe-based Virgo detector and 70 ground- and space-based observatories. The results resolve longstanding astronomical mysteries, said Richard O’Shaughnessy, assistant professor in RIT’s School of Mathematical Sciences, who was part of the LIGO team that measured the properties of the neutron stars. Neutron stars—corpses of massive stars formed in supernova explosions—emit signals that can be observed by both gravitational-wave and traditional astronomy. The neutron star collision created a flash of gamma rays detected by the Gamma-ray Burst Monitor on NASA’s Fermi Space Telescope. 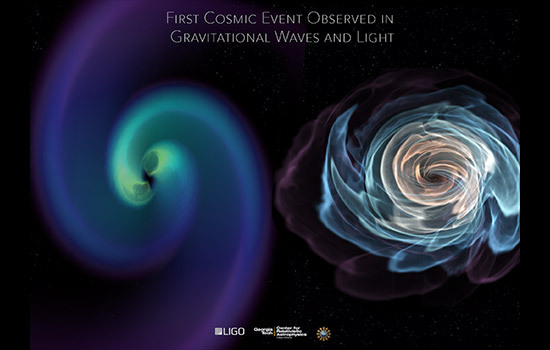 The light was seen on Earth two seconds after LIGO-Virgo detected the gravitational waves. Signals of other forms of light, or electromagnetic radiation—X-ray, ultraviolet, optical, infrared and radio waves—were also detected. “By seeing the flash of light and the gravitational waves associated with the merger, we were able to pin down precisely what it was, and that it made multiple things happen at the same time,” O’Shaughnessy said. Gamma rays: These flashes of light are now definitively associated with merging neutron stars and will help scientists figure out how supernova explosions work, O’Shaughnessy said. Cosmology: “Scientists now can independently measure how fast the universe is expanding by comparing the distance to the galaxy containing the bright flare of light and distance inferred from our gravitational wave observation,” said O'Shaughnessy. RIT faculty in the LIGO Scientific Collaboration include Campanelli, O'Shaughnessy, Whelan, Carlos Lousto, Yosef Zlochower andHans-Peter Bischof. They are members of the Frontiers of Gravitational Wave Astrophysics, an RIT signature research initiative within the center, which supports research in multimessenger astronomy, and plays a leadership role in educating students and in developing space-based detectors. The Findings of the LSC and the Virgo collaboration are published today in the journals Physical Review Letters, The Astrophysical Journal Letters, and Nature. Among the authors of today's papers are Lousto, O'Shaughnessy, Whelan, post-doctoral researcher James Healy, and several student researchers at the Center for Computational Relativity and Gravitation: Monica Rizzo, an undergraduate physics major; John Bero, an MS student in the astrophysical sciences and technology graduate program; and Ph.D. students in astrophysical sciences and technology (AST) Jacob Lange, Jared Wofford, Daniel Wysocki and recent Ph.D. recipient Yuanhao Zhang. Doctoral students Brennan Ireland (AST) and Nicole Rosato (mathematical modeling) are also members of RIT's group in the LSC. Rizzo works closely with O’Shaughnessy on parameter estimation, a type of analysis that uses statistical methods to make predictions about the system that produced the gravitational waves. About RIT’s Center for Computational Relativity and Gravitation: The Center for Computational Relativity and Gravitation is a Research Center of the College of Science and a Research Center of Excellence at the Rochester Institute of Technology dedicated to research at the frontiers of numerical relativity and relativistic astrophysics, gravitational-wave physics, its connection to experiments and observations, and high-performance computation and scientific visualization. Founded in 2007, the CCRG now includes tens of high-caliber faculty, research scientists, postdoctoral researchers, and an increasing number of graduate and undergraduate students across several departments and colleges. For more information, go to http://ccrg.rit.edu.